What compensation can I expect if I suffered permanent brain damage in a Missouri car accident? Hundreds of people live with the effects of a traumatic brain injury on a daily basis. Each year, 1.7 million people in the United States suffer a TBI. Some respond well to treatment; others, unfortunately, never completely recover. If you or someone you love suffered a serious head injury that resulted in permanent damage after a Missouri car accident, you are likely eligible for compensation. Often, when permanent injury is involved, the victim can opt for one large lump sum or a monthly payment for an unspecified time period. It's important that you keep your medical care plan in mind when trying to determine whether a settlement that has been offered is enough. An experienced St. Louis car accident attorney can help you determine how best to frame your request for compensation. 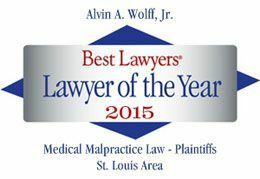 To see if we're the right lawyers for you, contact Alvin Wolff Jr. today at 314-241-2500 for a free consultation or your copy of The Guide on How to Pick a Lawyer.